Yelp's emoji search: The mobile app's new feature is somewhat baffling. What Yelp locations do you think should have a sobbing face? Pretty nifty, right? The search function’s interpretation of some emojis are surprisingly clever and, often, quite useful. Searching a pair of scissors produces listings for hair salons; an Italian flag gives a list of Italian restaurants; and a high heel spits out the nearest shoe stores and cobblers. The new feature begins to get wonky, though, when using emojis that are less obviously related to food, retail, or a specific service. Keeping the search set near the East Village (for the sake of consistency), I tried plugging in the broken heart symbol. The results? “Broken Heart Tattoos,” “Smooth Skin Factory,” and “Pirka” (a hair salon). Searching a monkey resulted in a Yelp ad for “Chevys Fresh Mex” (a Mexican bar), two other bars with “monkey” in their names, and “Tech Grease Monkey,” an IT services and computer repair shop. It sort of made sense but wasn’t exactly helpful. Even weirder were the results for traditional emotion-bearing emojis—i.e., a smiley face, an angry face, a crying face. Once again sticking near the East Village, I searched the wide-grin happy face icon. The ad Yelp returned at the top was for a Thai café with a mediocre 3.5-star rating. Below that were results for a pricey Japanese sushi bar, a coffee shop named “The Smile,” and an organic health market. Then I tried the flip: a sad, teary face. 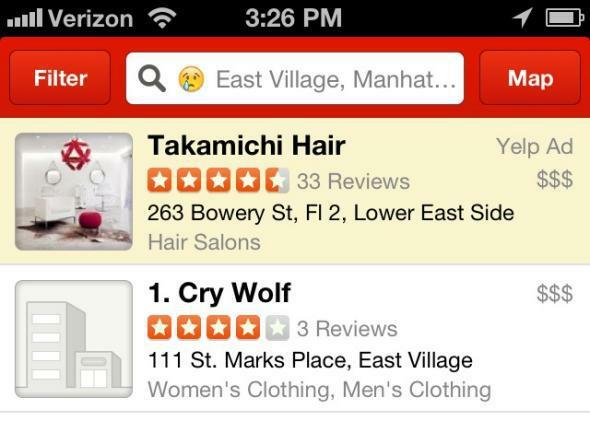 Again, Yelp picked an ad to display at the top of the search, this time for Takamichi Hair, a hair salon in the Lower East Side. The next result was “Cry Wolf,” a clothing shop, then a bar/music venue called “EP,” a Thai place, and a pizzeria. Their ratings ranged from 4.5 to 3.5 stars and they seemed to have little in common other than their mostly inexplicable association (setting aside “Cry Wolf”) with the teary-eyed icon. The emoji search was born from Yelp’s last hackathon and officially launched for users on March 24. Most—if not all—emojis on iOS and Android are now tagged with keywords to return search results. “We enjoyed it so much we wanted to share the fun with Yelpers,” said Rachel Walker, a company spokeswoman. Users undoubtably will have fun with the new feature, but some businesses might be rankled. If I were the owner of Takamichi Hair, I wouldn’t be too happy knowing that my Yelp ad was coming up by searching an emoticon most commonly associated with grief and sadness. The unexplained rollout could actually be more for Yelp’s purposes than for its users’. Emojis can be extremely useful for tech companies when it comes to labeling and collecting data, because they are easier for machines to interpret than informal, everyday language. Machines are notoriously bad at picking up tone, but emoticons, photo tags, hashtags, and the like create categories computers can understand. The users do the heavy lifting and the company reaps the rewards of more effective ads and better data mining. In Yelp’s case, having users incorporate emojis into restaurant and store reviews could be a better measure of customer sentiment for data-driven algorithms than the hundreds of different adjectives and phrases that pop into reviews. But if the company were smart, it might want to pare down the range of symbols that actually work. Some of the results right now are just too weird.